Glass Vessel Sink in Rectangular Russet with Faucet in Oil-Rubbed Bronze is rated 4.8 out of 5 by 24. Rated 3 out of 5 by disappointed from I wouldn't recommend this combo on its entirety. 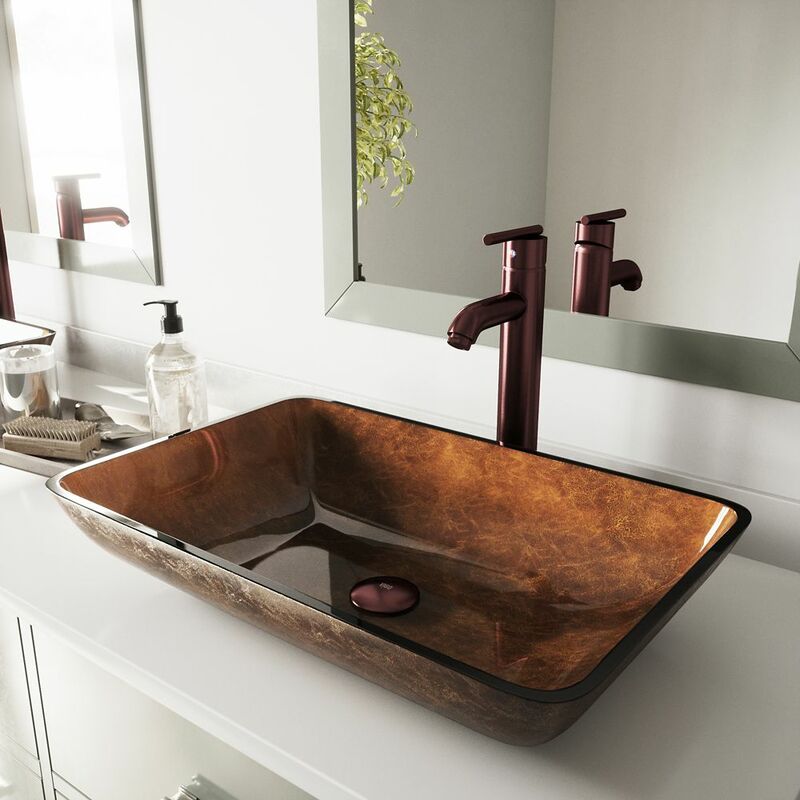 I absolutely love the sink but the faucet is no... I wouldn't recommend this combo on its entirety. I absolutely love the sink but the faucet is not the right color. I wanted the brushed bronze. Apparently the oil rubbed bronze is different. Now my faucet is purple in color which will not match my hardware such as the towel racks and toilet paper rack, light fixtures etc.... I am so disappointed in that. I haven't tried to see if Home Depot will take the faucet back and let me exchange it for something that matches but I hope so. Otherwise I love the sink it is so beautiful. I however don't like how it installs. It is about a 1/2 inch off the counter I thought it would be on the counter I could understand a rubber gasket to hold it steady but it has a little stand. Things can get underneath it. It won't be fun trying to get stuff from underneath. Rated 5 out of 5 by CMC40 from Love it Beautiful product.....exactly like the picture. Love it. Rated 5 out of 5 by TRG from Thank so very happy and impressed with the beauty and... Thank so very happy and impressed with the beauty and quality of the sink and faucet! I love it! Rated 4 out of 5 by Yosh from Red The sinks are spetacular! Better than I expected and packaged very well. The faucets are red, nowhere close to matching any oil rubbed bronzed finishes, ever. Rated 5 out of 5 by Sundar from Well designed , functional, easy to install, good look, easy to clean. Well designed , functional, easy to install, good look, easy to clean.